I’m still missing a few stories featuring the Fourth Doctor. In the Marvel US reprint of this story it would be the first US comic appearance of the Fifth Doctor. I picked up the IDW version and reviewed it when it first came out as part of This Week’s Reviews. What you are about to read is the original post with an added section for updated thoughts. The Event Synthesizer is a giant keyboard that keeps harmony in the universe. When the Prime Mover accidentally hits the wrong key, the demon Melanicus breaks free and seizes control. Time is thrown into chaos, and the Doctor teams with a time-displaced knight to find the answer. However, the TARDIS has a stowaway who somehow is connected to the weirdness the Doctor experiences. What they got right: The first reprint to feature the fifth Doctor (Peter Davidson), the originals were in black in white for the magazine. Instead of using the colors of the original US comic reprints (by Marvel, whose UK group makes the magazine, or at least made since I don’t know the current status), they went with their own, and while it makes Davidson look older than he is, the rest of it is pretty good. What they got wrong: Anything I’d put here goes more to my personal taste and the fact that I’m a US guy, so I’m used to different things in my sci-fi than the UK. I’m pretty sure Parkhouse didn’t take us into consideration. 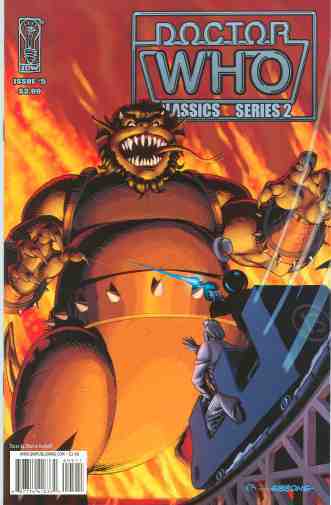 However, UK sci-fi in comics always seems odd to me. (See also their Star Wars and Transformers work.) Harmony is kept in place in time thanks to one guy and his giant pipe organ? Updated thoughts: The whole Event Synthesizer thing is rather odd and I wonder if it fits in regular Who lore. The part about the Doctor looking older varies from panel to panel but IDW’s coloring works better here than previous stories. This is also the debut of Sir Justin, who I kind of wish hung out longer, and the mysterious Shayde. There are things that get confusing, like the TARDIS ending up in a giant bathtub, a giant Shayde coming in to pull the plug that lets them into a carnival. There the Doctor sees I think Zoe and when he tries to talk with her ends up in a roller coaster that leads to Melanicus. (The cover is the actual last panel of the issue.) It’s a bit confusing for this Yank. Also interesting is that the Doctor (still the roving President of Galifrey at this time) goes into the mind bank and meets with Rassilon and others to learn why time’s gone all bonkers, and among them is Merlin, who appeared in an earlier story and was the one who banished Melanicus until a bad cord on the Synthesizer released him. In hindsight, seeing Merlin here is odd because during the Sixth Doctor’s run on TV there’s a tease as to whether or not the Doctor himself is Merlin, which I doubt new Who will ever remember to address. That could be an interesting season if they do. Recommendation: If you like Doctor 5, you’ll like this comic. Finding the originals would be hard, and the original Marvel US reprints only slightly less so. This was my first full Doctor (I started watching during the tail-end of Tom Baker), so it’s nice to finally catch up with these stories. Posted by ShadowWing Tronix on December 5, 2018 in Television Spotlight, Yesterday's Comics and tagged Fifth Doctor, IDW Publishing, Melanicus, Merlin, Rassilon, Shayde, Sir Justin. I feel so lucky to have all of the original U.S. Marvel reprints of Doctor Who. That cover that IDW selected is fantastic though. Having the Doctor actually be Merlin would be quite intriguing. Merlin has certainly appeared in many various comic book titles and cartoons over the years….both as Merlin and as other versions but that are quite obviously inspired by Merlin. Yes, British science fiction is different from American sci-fi, but I quite enjoy the quirkiness of British sci fi. That’s one of the attractive qualities of Doctor Who (along with many others such as a deep respect for history and the endless story possibilities that come from it).